Sheraton Cairo Hotel & Casino Is Serving Up Some Once-in-a-Life-Time Opportunities! While being constantly on the road leaves you homesick, the perks of staying at a hotel are countless, especially if it’s a luxury hotel like Sheraton Cairo Hotel & Casino, where you can easily become a member of the award-winning Marriott International Loyalty Programme, Starwood Preferred Guest, aka SPG. Imagine a VIP-access to an unlimited amount of A-list events that cover sports, music and even gourmet culinary experiences, with just a click of a button. All you have to do is log into SPG‘s experiential platform, SPG Moments, and use your Starpoints to bid on your up-coming adventure; you bid the highest, you win! One of the many unique experiences came to life the week before, when Sheraton Cairo Hotel & Casino hosted a once-in-a-lifetime experience that took place by the Pyramids. 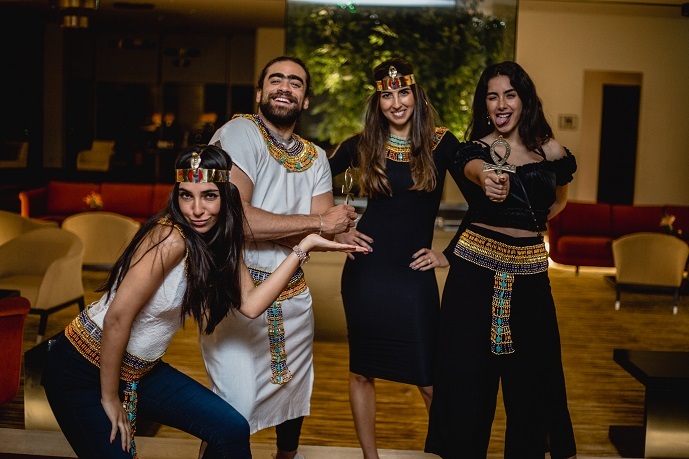 The quest started with Pharaonic –themed dinner at the hotel’s Club Lounge, before heading the Pyramids of Giza at midnight, where real magic ensued. Clad in white linen outfits and accessories that are inspired by the grandiosity of the ancient times of the pharaohs, the five lucky members were admitted to the equally grand chamber of the Great Pyramid of Cheops, before witnessing the splendid moment of watching the sun rising over the land of the Nile. This dreamy experience reflects SPG Moments’ approach to build an emotional connection, by curating exceptional experiences that creates an unforgettable memory: “SPG Moments gives us the opportunity to connect with our members through their passion points and build strong emotional connections with thoughtfully curated once-in-a-lifetime experiences” says Hans Joerg Kreitner, The General Manager of Sheraton Cairo Hotel & Casino. What are you waiting for? Log in SPG Moments and make the bid to earn yourself an everlasting memory.